On her social media feed just now, Dr Caroline Leaf, communication pathologist and self-titled cognitive neuroscientist, said, “Your perceptions adjust your brain chemistry”. Hmmm … yes and no. I’m not really sure what Dr Leaf is trying to suggest with this statement, because it’s so vague. The brain works through the passage of an electrical current travelling along a nerve cell, and being passed to the next nerve cell by the release of a “chemical” neurotransmitter that floats across the space between the nerve cells. 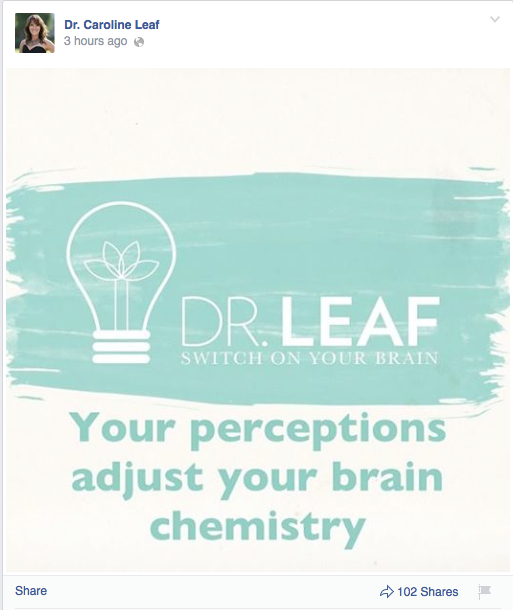 If that’s what Dr Leaf is referring when she talks about our brain chemistry, then sure, our perceptions adjust our brain chemistry. But then again, so does everything else that our brain does. In this sense, perception is nothing special. What I think Dr Leaf was trying to suggest is that our mind influences our brain chemistry, following along with her “mind controls matter” theme. But perception is the process of translating the raw data into a signal that the brain can process, for example, the light coming into your eye is translated into the electrical impulses your brain can utilise. It’s not an explicit process. It has nothing to do with our consciousness or our volition. Also, our “brain chemistry” as it’s considered in neuroscience is usually referring to the neurotransmitters and their function, which is often determined by our genetics and influences how we perceive and understand our environment . So if anything, it’s not our perception altering our brain chemistry, but rather it’s our brain chemistry that alters our perceptions. Our mind does not control our brain. Our brain is responsible for the function of our mind. This entry was posted in Biological, Caroline Leaf, Psychological and tagged brain, brain chemistry, caroline, caroline leaf, cerebral cortex, chemistry, cognitive neuroscientist, criticism, dr caroline leaf, Dr Leaf, Facebook, implicit memory, Leaf, memory, mind, neurobiology, neurotransmitter, perception, psychology, serotonin by cedwardpitt. Bookmark the permalink.